What Do Mother Elephants Do After Giving Birth? Most animals nurture their offspring only until the young are capable of fending for themselves; after that, mothers and children go their separate ways. 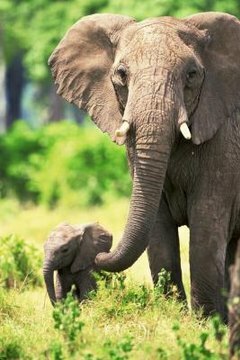 People who study elephants maintain that the range and intensity of these creatures' emotional responses resemble those of humans more than other animals, something especially evident in the deep, loving bonds seen between a mother elephant and her calf. Typically, mother elephants and their daughters remain together in a matriarch-led herd from birth until they are separated by death. Sons eventually strike out on their own; when family reunions occur, they're joyous occasions. At 22 months, the elephant's gestation period is longer than that of any other mammal. This allows the infant's brain to reach a relatively advanced stage by the time of birth. A study into the chemical and biological processes at work in elephant gestation followed pregnant elephants at 17 zoos, monitoring internal changes by ultrasound. The authors of this study, published in June 2012 in "Proceedings of the Royal Society B," hope that better understanding of what goes on inside an elephant's body during pregnancy will lead to the development of contraceptives that can eliminate culling as a means of reducing overpopulation in the wild. One morning in February 2012, wildlife photographer Paolo Torchio, driving in Africa's Amboseli National Park, spotted a herd of elephants in a protective huddle and couldn't believe his luck: He was about to witness -- and photograph -- the rarely seen birth of a calf. When a snooping hyena came too close to this "wall of muscles and tusks," he said, the guardians of the birthing female stomped menacingly and flung dirt, causing this would-be scavenger to beat a hasty retreat. After the arrival of the newborn, greeted with loud celebratory trumpeting from the whole group, the adults broke formation to admire the baby and try to help the newborn stand on his own. Less than an hour later, the calf wobbled to his feet and was rewarded with his first drink of milk. The baby elephant drops to the ground from the mother's birth canal inside the amniotic sac, which breaks when it hits the ground, releasing both the calf and a lot of fluid. The elephants assisting the mother scrape dirt and grass over damp spots so the smell won't attract predators. The organ that has nourished the baby throughout its time in the womb, the placenta, may not be expelled for a few more hours. When it is, the mother observes standard procedure for many wild animals -- she eats it. To leave it lying on the ground would constitute an olfactory announcement to all predators within miles that a toothsome, tender newborn pachyderm was now within their territory. For a couple of days, the herd pauses to give the newborn a chance to rally his strength; but elephants need a lot of food, and they have to keep moving to get enough. The baby walks underneath his mother, who seldom loses physical contact, helping the little one to his feet if he falls, lifting him and carrying him over obstacles, bringing him back when he wanders off. If the infant squeals, not only the mother but the entire herd will rush to his aid. In a heartbreaking video filmed for the PBS series "Nature," filmmaker Martyn Colbeck documented the ultimately unsuccessful attempts of a mother elephant whose calf had been born prematurely to bring her baby around. After he died, she stood guard over his body for four days. For more than five decades, Dr. Dame Daphne Sheldrick of the David Sheldrick Wildlife Trust has been working with orphaned elephants in Kenya's Tsavo National Park. Dame Sheldrick calls the elephant "not only ... the largest land mammal on Earth, but also the most emotionally human." Baby elephants whose mothers have died, usually at the hands of poachers, are notoriously difficult to keep alive. After 28 years of trial and error, Dame Sheldrick finally hit upon a formula that seemed to provide milk-dependent orphans with an adequate balance of nutrients. After that, the ongoing priority is to heal the life-threatening emotional trauma in the calf caused by separation from its mother, often after witnessing her being hacked to death. What Does It Mean When the Hamster Mom Kills the Babies? When Do Giraffes Start Walking? How Often Do Elephants Mate Per Year? How Do Goslings Recognize Their Mothers After They Are Born? How Many Offspring Do Giraffes Have at a Time?